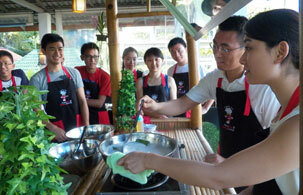 Our Thai cooking school offers hands-on 1/2 day and full day classes–beginner, vegetarian, private classes, professional Thai cooking courses (1-8 weeks), fruit carving and team building events. Our English-speaking Thai chefs will teach you authentic Thai cooking in our comfortable and scenic professional classrooms which are conveniently located on a hill 10 minutes from Patong Beach in Kathu. First, our chef instructor will demonstrate each dish, and then you will have an opportunity to duplicate what she shows you.